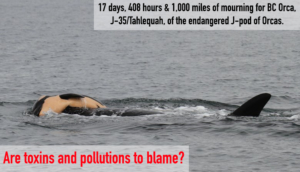 A common display of mourning turned plea for help, as the Orca J-35 (aka Tahlequah), carries her dead calf for the longest ever recorded time of 17 days and over 1,000 miles. The act has struck an emotional chord worldwide, but what action could have been taken to initially avoid this tragedy? With the depleting food supply of salmon due to overarming and pollutants in the water from major vessels leaking toxic oil into the ecosystem, there has been no successful births in this endangered British Columbian pod of Orcas in over 3 years. With extinction coming up on the horizon for these deeply intelligent, and obviously emotional, mammals what can be done by the marine industry. BNAC Environmental Solutions provides a vast selection of options with ‘Green Marine’ certification to help industry leaders do their part. A major contributor being our line of bio-oil – Panolin – which when leaked or spilled into waters will not cause any harm to the surrounding ecosystems, will not poison the food chain of our beautiful British Columbian Orcas, and in the end saves the vessel owner money. Are you a marine provider that is interested in helping save the J-pod orcas as well as the future of our planet? Contact BNAC Environmental Solution to take your first steps in saving our planet!